WOW! 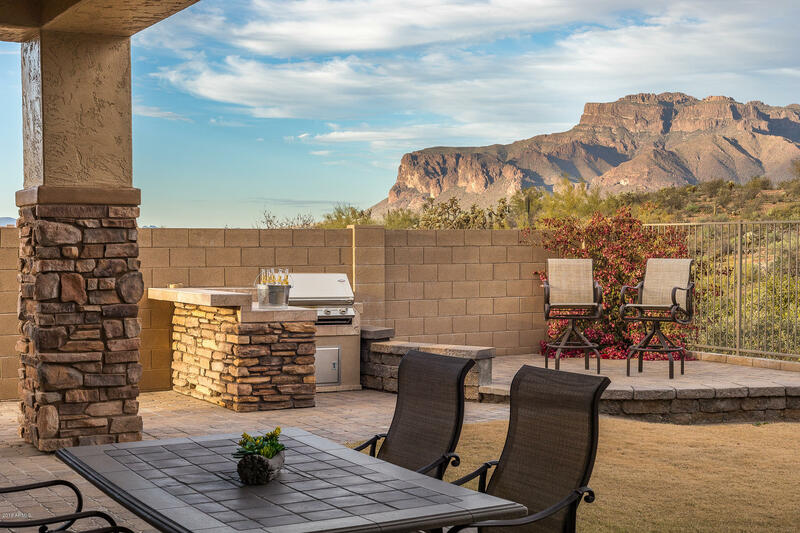 Semi-Custom TOLL BROTHERS HOME home on a PREMIUM LOT with STUNNING SUPERSTITION MOUNTAIN VIEWS inside & out! You'll be impressed with the long list of the desirable upgrades including... a PRIVATE GATED COURTYARD w/high quality, easy maintenance, flagstone design concrete coating on driveway too, CULTURED STONE EXTERIOR ACCENTS, new exterior paint, EXPANDED PAVER PATIO with multiple seating areas, BUILT-IN TRAVERTINE & STAINLESS BBQ, premium new flooring, 12' CEILINGS, gourmet kitchen, HIGH END STAINLESS appliances, GORGEOUS GRANITE & STAGGERED HEIGHT CABINETRY, large island, huge walk-in pantry, SPACIOUS MASTER SUITE w/2 walk-in closets & patio exit! FLEXIBLE FLOORPLAN w/3 guest bdrms or ofc/workout rm + game/media rm! This sought after community is... ...extremely popular Superstition Foothills subdivision! The low monthly HOA fee of only $45 is unheard of for the amenities offered including...heated community pool/spa with great Mountain View's and BBQ area, 52 well maintained walking trails, pet friendly park & close to shopping & dining too! NEW EXTERIOR PAINT - DEC 2018 NEW WOOD LOOK FLOORING - DEC 2018 New flooring is extremely popular for looks, easy maintenance and long lasting durability as it is both scratch proof and waterproof!